We provide professional “no pressure roof cleaning” throughout the greater Atlanta metro area to our residential and commercial clients. The warm and humid environment in the Atlanta, GA area contributes to rapid algae growth and infestation of all types of roofing materials including asphalt shingles, tile, cedar shakes and even low porosity roofing materials such as metal. Unfortunately even if you have a relatively new roof, it will not be long before those ugly and unsightly black stains bed themselves into your roof and dramatically reduce the curb appeal of your home or business. We provide industry leading practices when cleaning roofs which is reliant on environmentally friendly cleaning agents and a “Soft Wash” NO PRESSURE cleaning method. 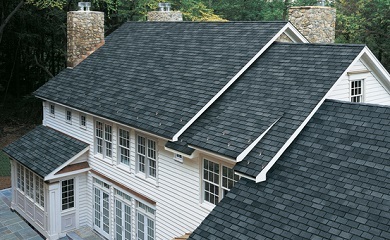 This process is the process recommended by the leading roofing manufacturers, such as GAF. It is also recommended by of the roof cleaning authorities in North America. This method will restore your roof without causing any damage to the delicate roofing material. In many cases we can clean your roof without the need to even step foot onto it. Where the need arises that we need to walk on your roof, we are fully trained in safety methods that ensure no risk to our safety. If your Atlanta area home or business is in need of roof washing service, the professionals at 1080 Pressure Washing are just a click or phone call away. Even if you choose to use another company, we leave you with the advice to run away from any company looking to use high pressure washing on your roof. It will no doubt destroy your roofing shingles and leave you with a much larger problem than you started with.